There are approximately 250,000 commercial and residential brokerage and management firms in the real estate space, generating hundreds of billions of dollars in business every year. And every single one of them is (or should be) taking advantage of modern digital marketing techniques like online listings, e-signing services, and 3D virtual tours to make buying property simpler and more accessible than ever. However, those digital marketing techniques come with a price: if you don’t stay current with the latest technologies, you fall behind your competition. Customers expect innovation and aren’t attracted to businesses that use outdated technologies or techniques. Luckily, there are a number of easy things your company can do to stay with the crowd. And one of the easiest and most effective technologies you can invest in right now is cloud computing. Adopting a cloud solution for your real estate practice has many advantages. So, ditch those file cabinets and antiquated on-premise servers and realize the benefits of operating your real estate business on the cloud. Depending on the size and success of your practice, you might have the financial wherewithal to host an on-premise server to house your data. These systems allow you to instantly access all of your important information without the hassle of manually searching a paper database. However, these monstrous infrastructures come with some pitfalls. On-premise storage solutions are often difficult and expensive to understand and maintain. You might have to hire a dedicated team of IT specialists just to keep the system running smoothly. Not only this, but a single data breach or natural disaster could wipe out your data for forever. In contrast, cloud-based storage platforms simplify, secure, and drastically cut the costs of data management. The National Real Estate Investor reports a 30 percent reduction in IT spending as a direct result of cloud adoption in the industry. Cloud platforms are administered by a vendor, so updates in usability and security are automatic and hands-off for end users and cost-effective for your business. Additionally, these systems are intuitive and user-friendly, so the barrier to entry and user attrition are much lower than that of an on-premise storage environment. The body of data that you store (wherever that may be) is a treasure trove of metrics and analytics. 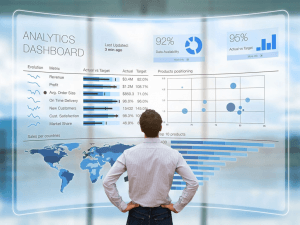 And when that data is properly analyzed, it can be your most powerful tool for driving strategic business decisions and maximizing revenue. And this is hard to accomplish when you are restricted to disparate systems or, heaven forbid, physical documents. Gartner estimates that only 15 percent of all Fortune 500 companies are leveraging big data analytics. This is caused in large part to lack of accessibility to the data in disparate systems. This failure to utilize big data leads to missed opportunities to better understand customers and predict their desires. Cloud computing is where you can really start to see big-picture changes in the success of your organization. When you leverage the cloud for your business, you can aggregate all of your data from any and every application into one centralized location. This allows for an in-depth look at all of your data and how each application interplays with the others. As a realtor, it is rare that you spend an entire day behind a desk. You are constantly out scouting locations and showcasing homes in order to make your next big sale. Because of this, you need all of your data and documents to be just as mobile as you are. A big selling point of cloud computing is the ability to access any information at any time on any device. This is obviously an enormous benefit to the real estate industry—having property and client management at your fingertips increases productivity and efficiency for realtors. There are several cloud-based solutions that help accomplish a more collaborative relationship if you have a team. Customer Relationship Management (CRM) software brings all customer and lead information into one easy-to-use platform for instant sales knowledge. Electronic signature services make for quick and convenient transactions and approval of deals. And if you leverage a live chat service for real estate agents like HelpSquad, you or an expert live chat agent can be available to address any client concerns from anywhere in the world. Real estate is a document-heavy industry. House deeds, bills of sale, title transfers, and home loans are just a few of the documents that make up the sea of paperwork required to buy property. The more you sell, the bigger the pile of paperwork is going to get! However, through cloud computing, most real estate documents can be digitized and sent back and forth quickly. If you couple this with the use of a live chat service such as HelpSquad, files, documents, and even photos can quickly and easily be shared back and forth between parties. This promotes quicker transactions and enables you to declutter those crammed filing cabinets in the back office. 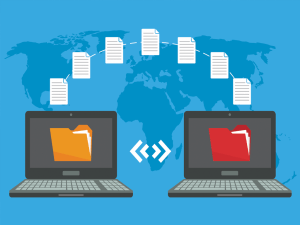 Some naysayers of digitizing documents cite cybersecurity as a major issue for your practice. However, cloud vendors are aware of this stigma and take cybersecurity very seriously. Any viable cloud services vendor will likely encrypt all of its client’s data and require multifactor authentication to gain access. Be sure to inquire about a cloud service provider’s steps to securing online data before you sign on with them. Cloud computing has ushered in a new dimension of internal and client interactions and relationships that make the complicated process of property acquisition easier than ever. So leave antiquated, manual documentation and data analyzation in the past where they belong. Take your real estate practice into the clouds.